Vermicelli is boiled in water till just soft and fluffy. All the vegetables are chopped up and cooked in oil along with dill leaves and spices. Finally vermicelli is added to the vegetables and briefly cooked till it absorbs all the flavors. Serve vermicelli dill upma with a glass of buttermilk. Makes: around 3 Servings of Vermicelli Dill Upma. Peel, wash and finely chop the potato, onion and carrot. Remove stems, wash and slice the green chillies. Wash and finely chop the cilantro and dill leaves. Heat a pan on medium heat, add vermicelli and roast until it turns light golden in color. Bring to boil few cups of water in a sauce pot, add a tsp of oil, few pinches of salt. When the water comes to a boiling point, add vermicelli. Boil vermicelli for around 2 minutes or until it is cooked with a slight bite. Immediately strain the cooked vermicelli and refresh with cold water. Heat oil in a pan on medium low heat, add all talimpu ingredients in order. When chana dal turns light brown, add green chillies, potato, carrot and onion. Once onion turns translucent, add dill leaves and salt. Fry till all vegetables are cooked and starts to turn light brown around the edges, add strained vermicelli and cilantro. Mix carefully and cook for a minute or two to let vermicelli absorb all the flavors. 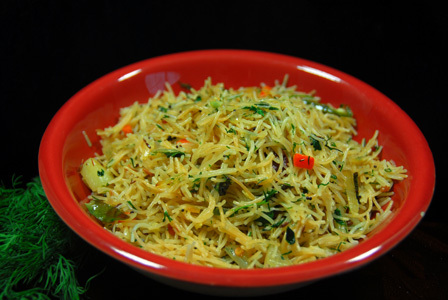 Serve dill vermicelli upma immediately. Suggestions: If vermicelli is overcooked, try not to boil it for so long next time or else don’t overcook it in the pan. Make sure all vegetables are cooked well before adding vermicelli. Variations: Add your choice of vegetables to the upma if you desire. Other Names: Vermicelli Dill Upma, Dill Semya Upma. Vermicelli is boiled in water till just soft and fluffy. 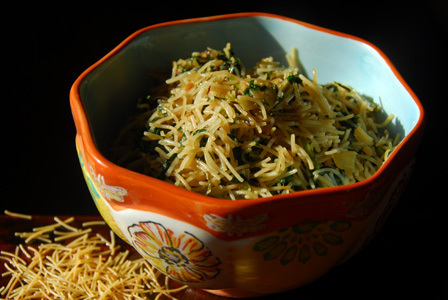 Freshly chopped spinach is cooked in oil along with onion and mixed with the vermicelli. Serve vermicelli spinach upma immediately. Makes: around 2 Servings of Vermicelli Spinach Upma. Wash the spinach leaves and finely chop them. Remove stems, wash and finely chop the green chiles. Boil vermicelli for around 1 – 2 minutes or until it is cooked with a slight bite. Immediately strain the cooked vermicelli and refresh with cold water to stop further cooking of vermicelli if necessary. When urad dal turns light brown, add chopped onion and green chiles. Fry for around a minute or until onion starts to change color. Stir in chopped spinach and salt. Cook on low flame till spinach wilts and most of the water has been evaporated. Then stir in cooked vermicelli and mix carefully. Remove from heat to avoid over cooking the vermicelli. Serve vermicelli spinach upma immediately. Suggestions: If vermicelli is overcooked, try not to boil it for so long next time or else don’t overcook it in the pan. Variations: You can also add few tablespoons of frozen peas if desired. Check other vermicelli recipes here. Other Names: Vermicelli Spinach Upma, Semya Palakura Upma. Vermicelli is boiled in water till just soft and fluffy. Roasted sesame is ground into powder with red chiles and mixed with the vermicelli. 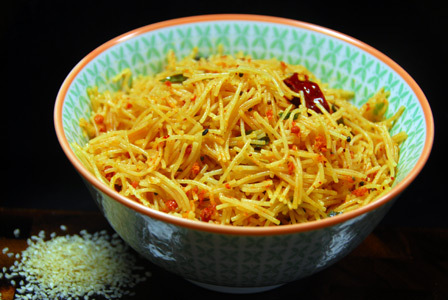 Serve vermicelli sesame upma immediately. Makes: around 2 Servings of Vermicelli Sesame Upma. Roast the sesame seeds in a pan on low heat until they turn golden brown in color. Roast the red chili for few seconds in the same pan and remove from heat. Grind the red chili and salt into powder using a grinder. Then add the roasted sesame and grind again into powder and keep aside. When urad dal turns light brown, add cooked vermicelli, ground sesame powder and salt (if necessary). Mix carefully and thoroughly to mix everything well. Serve vermicelli sesame upma immediately. Variations: Check other vermicelli recipes here. Other Names: Vermicelli Sesame Upma, Semya Pallila Upma. Vermicelli is boiled in water till just soft and fluffy. Roasted peanuts are coarsely ground and mixed with the vermicelli. Serve vermicelli peanut upma immediately. 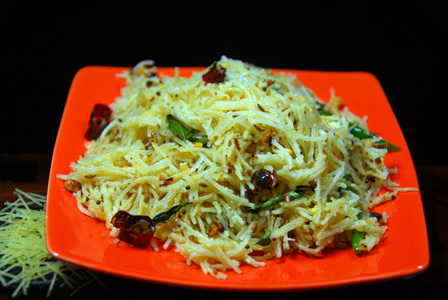 Makes: around 2 Servings of Vermicelli Peanut Upma. Remove stems, wash and slice the green chiles. Coarsely grind the roasted peanuts and keep aside. If using frozen scraped coconut, microwave for few seconds to soften and keep aside. When urad dal turns light brown, add green chillies. Fry for few seconds, add scraped coconut and peanut powder. Add the cooked vermicelli and salt. Mix thoroughly and remove from heat to avoid over cooking the vermicelli. 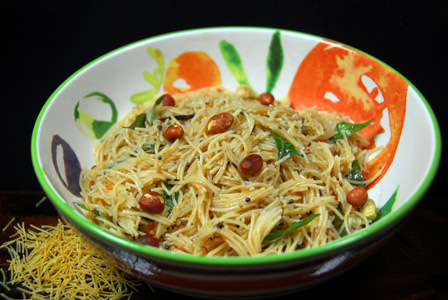 Serve vermicelli peanut upma immediately. Variations: Use roasted vermicelli in place of vermicelli. For roasted vermicelli, heat a pan on medium heat, add vermicelli and roast until it turns light golden in color. Other Names: Vermicelli Peanut Upma, Semya Pallila Upma. Vermicelli is boiled in water till just soft and fluffy. Tamarind is soaked in water and the pulp is extracted. The prepared pulp is briefly cooked in oil along with spices and mixed with the vermicelli. Serve vermicelli tamarind pulihora with a glass of buttermilk. Makes: 1 – 2 Servings of Vermicelli Tamarind Pulihora. Heat a pan on medium heat, add vermicelli and roast until it turns light golden color. Fry for few seconds, add tamarind pulp and jaggery. Let the mixture come together a bit (less than a minute) and remove from heat. In a mixing bowl, add the vermicelli, above tamarind mixture, turmeric powder and salt (if necessary). Mix thoroughly and carefully and garnish with roasted peanuts. Variations: You can also add chana dal to the talimpu ingredients if desired. Other Names: Vermicelli Tamarind Pulihora, Semya Chintapandu Pulihora.